Good morning! This is my design team card for this week’s Triple Threat color combo over at Dynamic Duos. I love to play along with challenges, but sometimes they just stump me, and I throw in the towel and move on. And I have to say that this one stumped me! But I’m on the design team (it still feels strange to say that!) and can’t get stumped, so I powered through. ;) I kept trying to make a Christmas card, and I did make one, but it kind of came out as just a card. Nothing special. So I went back to square one and stopped trying to force a Christmas card out of my head, and I got this. I like this much better. I didn’t really start out intending to tear up the Pear Pizzazz paper, but after I embossed it, I decided to take a little off the edges. I kept messing up my tears, so eventually half my mat was gone. Haha! I like how it turned out, though. 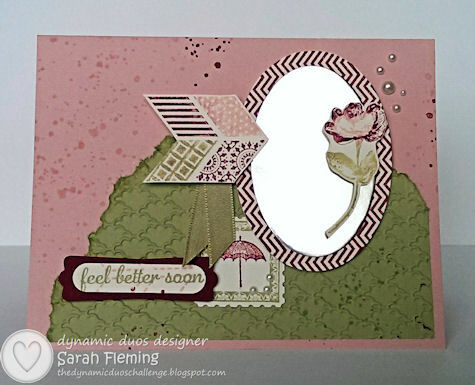 The mirror frame (not really intended as a mirror, but then I added the Silver Foil, so it became a mirror), flower, and arrow are all from the Oh Hello stamp set. The sentiment is from the beautiful hostess set Express Yourself, and the postage frame and umbrella both come from another hostess set, Postage Collection. I love the hostess sets Stampin’ Up! has this year! I have about half of them already and have my eye on several more. I colored the flower in first with a Blushing Bride marker, then around the edges with the Raspberry Ripple marker. I love how the flower turned out — it’s my favorite part of the card. Well, I also really love the pearls. The only thing I don’t love about the card is the ink spots. They were kind of an afterthought. Everything was glued down and dimensionaled up, and I pulled out Gorgeous Grunge on a whim. Afterward, I wished I hadn’t. Oh well. 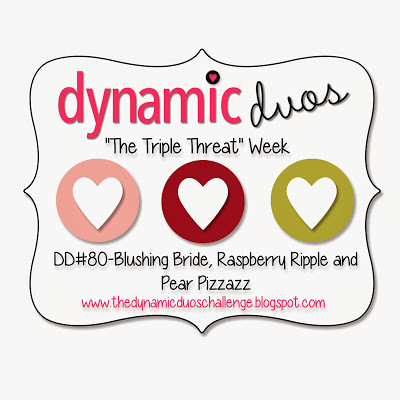 I hope you’ll join us this week at Dynamic Duos. We’d love to see your creations! I have to run — I’m selling a lot of cards plus some other crafty things made with SU! supplies at a MA-liday (rhymes with holiday) Bazaar this morning, and I’d like 2 hours of sleep before I go. The MA is because all the sellers at the bazaar will be “mompreneurs”. If you’re in the Treasure Valley, the bazaar is at 1247 E. Fairview in Meridian from 10 to 1 in the Fit For Motherhood studio. Come see me peddling my wares! There will be lots of great vendors!